Nsobe Camp offers an opportunity to relax and get in touch with nature whether you are looking for a weekend break, a corporate conference, a fun team building event or a destination wedding. 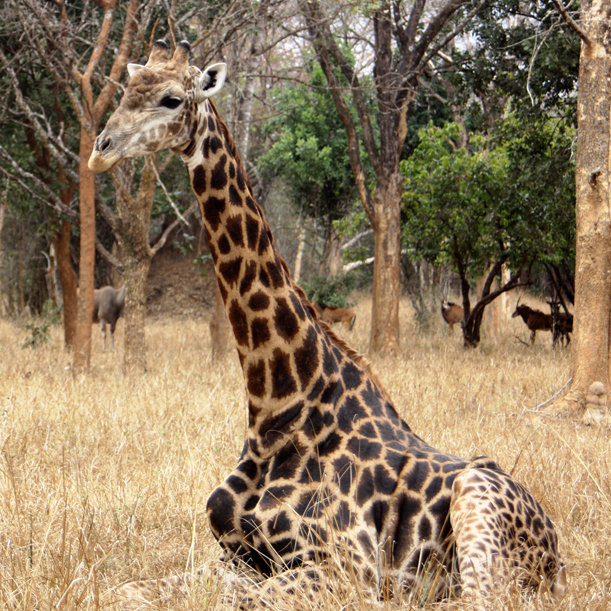 Located on a pristine Miombo woodland game-farm, overlooking a beautiful dam, Nsobe is home to giraffes, zebras, warthogs, various nocturnal animals, monkeys and 15 species of antelope, including the rare Sitatunga, Black Lechwe and Sable. Over 300 species of bird-life have been spotted. Nsobe traces its origins to the Cape to Cairo railway. In 1908 the Steam Engine track was laid through what would become Nsobe Game Camp and Miengwe Farm. Cottage 200 (the ruins of which are on the farm) was built and a man called George Rankin was based there with the task of keeping the steam trains supplied with water and wood fuel. On retirement Mr Rankin was given a farm cut out of the forest reserve, adjacent to the railway line. This farm plus surrounding plots grew to be Nsobe. Nsobe Game Camp was started in 2001, and is part of a 1500 hectare commercial farm, Miengwe Farm Ltd. Other core businesses on Miengwe Farm are Fisheries, Beef Herd and Feedlotting, Piggery, Processing and Game Ranching. Nsobe Game Camp and Miengwe Farm are currently undergoing a Management Buy-out, and as a reward for our people’s commitment 50% of the shares will be held by our employees once the buy-out is completed. Nsobe Community School provides quality education for our surrounding village children. We have 5 en-suite Safari Tents, and 7 Chalets serviced by our Restaurant and bar. Our safari tents and take the hassle out of camping without losing the feeling of being outdoors. 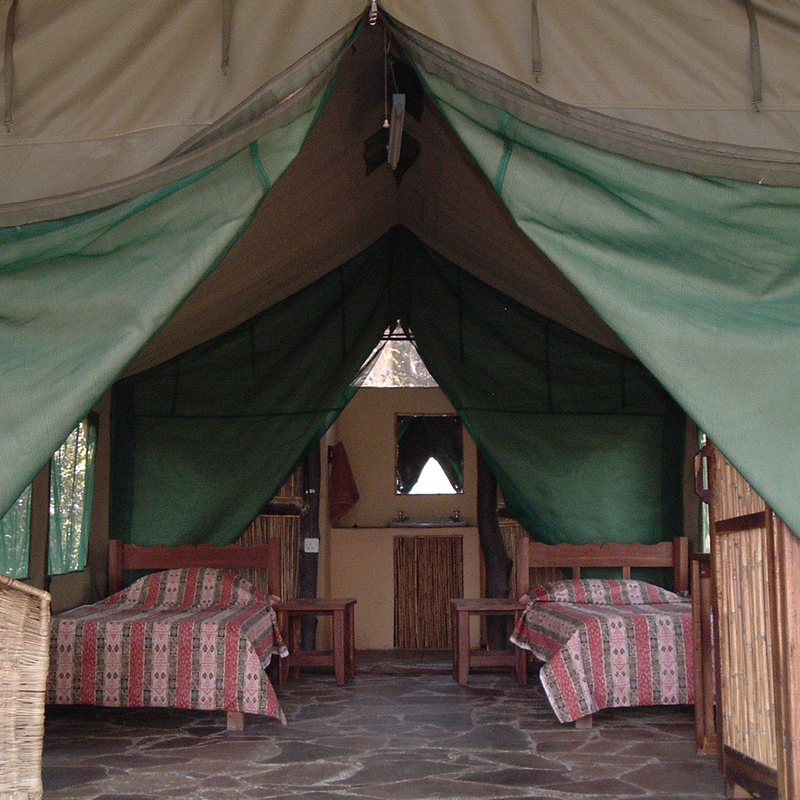 The tents contain twin or double beds with ensuite bathrooms. Fully furnished and protected against mosquitos and any other wandering wildlife, you’re ensured a great nights sleep. Includes private deck with views over the water, perfect for sundowners or lazy birdwatching. 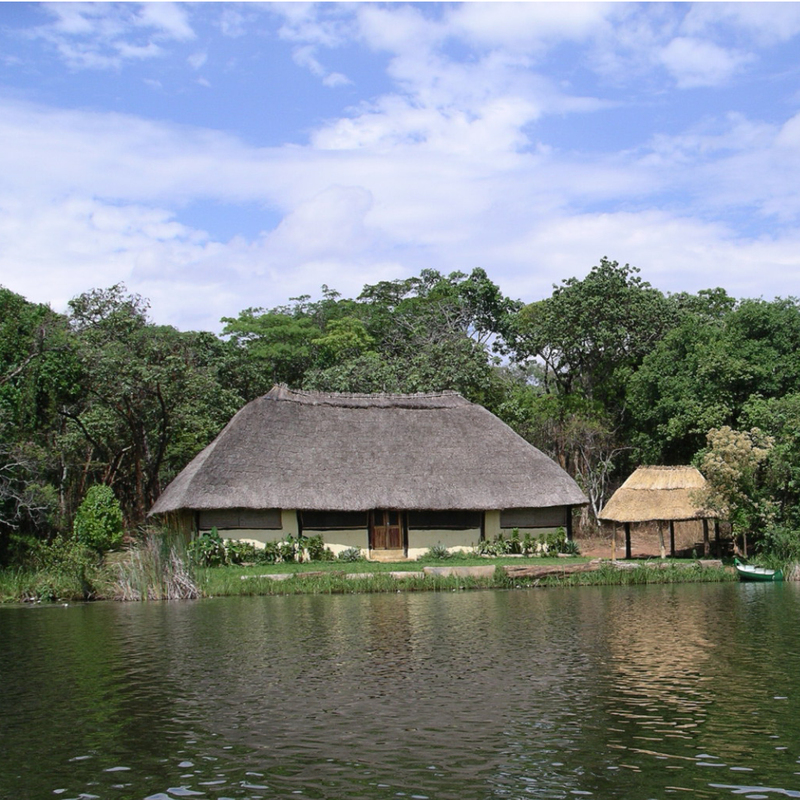 If you are a family or a group of friends looking to spend some time in the bush, Nsobe has a variety of chalets to choose from. 2 Family chalets that each sleep four each. 4 Chalets that sleep 3 1 Chalet that sleeps 2 All have decks to sit on in the evening to watch the sun set and are fully furnished, with bedding and towels provided. Meals and drinks are provided at the main restaurant and bar. This 8-sleeper chalet is right on the water’s edge, perfect for a fishing party or family getaway. There are 4 bedrooms all with twin beds and 2 bathrooms. The open plan kitchen/dining area is fully equipped plus there is a braai area. All you need bring is your food and drinks, or you can dine out at the Nsobe restaurant – a 5 minute walk away. 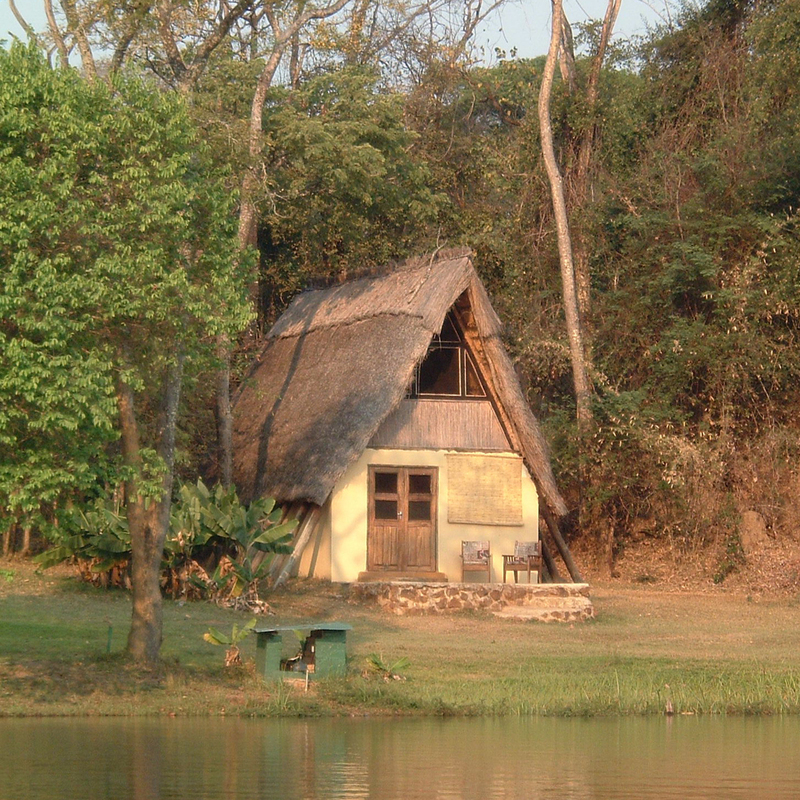 Tucked away in the miombo forest overlooking the water, this private cabin sleeps 6 guests. It is fully equipped with an outside braai area and bush campfire, and visited by many birds, skyes monkey – at night you can hear the Sitatunga wading in the water below. 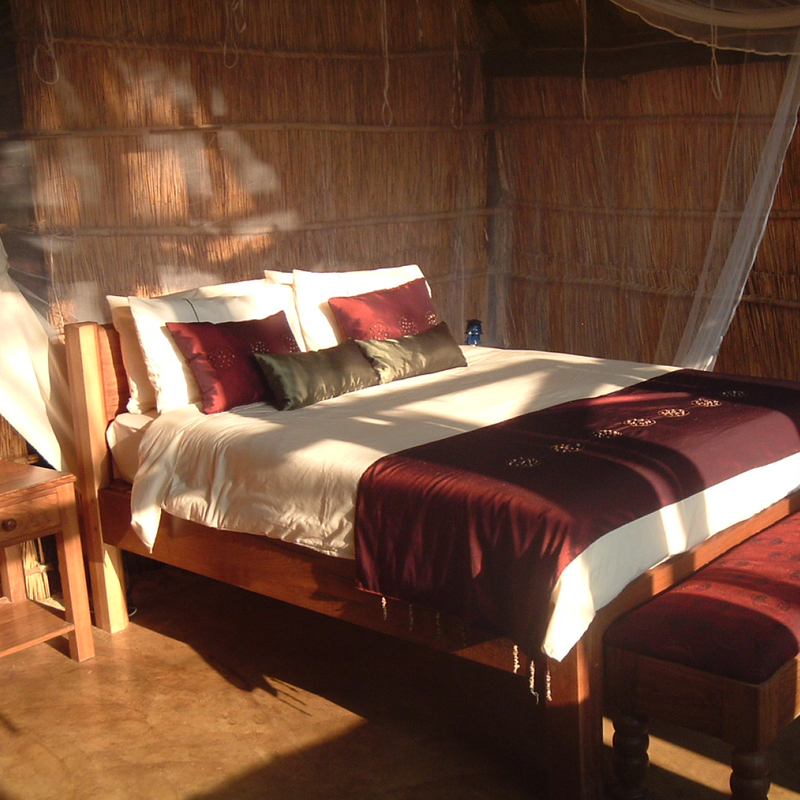 Miombo Woodland View is a beautiful, rustic stone and thatch ‘nsaka’ ideal for couples who want to escape the hustle and bustle of life in town and be completely alone in the African bush. Perched on the highest peak in the park, you are treated to breathtaking views of the surrounding woodland, without lifting your head from your pillow! Your chalet is open on all sides, with an outside dining area under the trees and an open air bathroom a few steps down the side of the hill. Woodland view is available with full board and a butler service, that is completely flexible to suit your schedule and requirements. Experience a very special night together in this unique bush hideaway. K35 per person per nightplus entry fee K30 per child under 16yrs plus entry fee Entry fee (day visitors & campers): K25 per adult, K10 for children below 12 years. Only three hours drive from Lusaka, Zambia’s capital city, hidden away in beautiful untouched forests lies Mukuyu Bush Camp. The camp is comprised of 5 unique chalets and a central dining area built by local artisans using traditional materials. 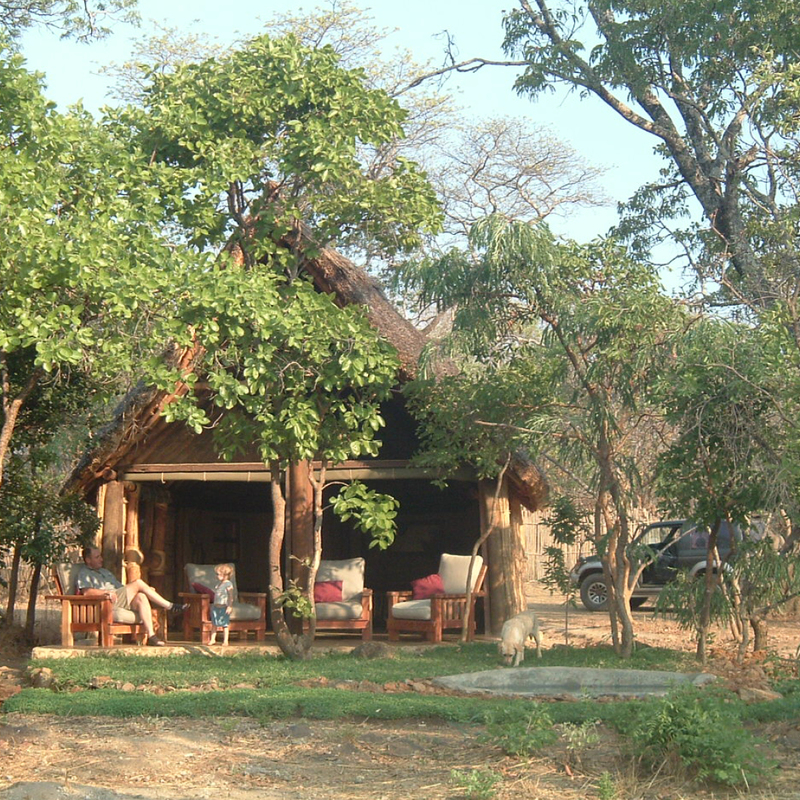 The camp is situated in the middle of Nsobe Game Reserve, which abounds in a wide variety of bird and animal life. Careful attention has been given to the construction of the camp to ensure minimal effect on the environment and this is evident in the way the buildings blend beautifully into the surrounding bush. Waking up in the morning to a herd of impala grazing around your chalet or enjoying a revitalizing shower in your open-air bathroom are experiences you won’t soon forget. 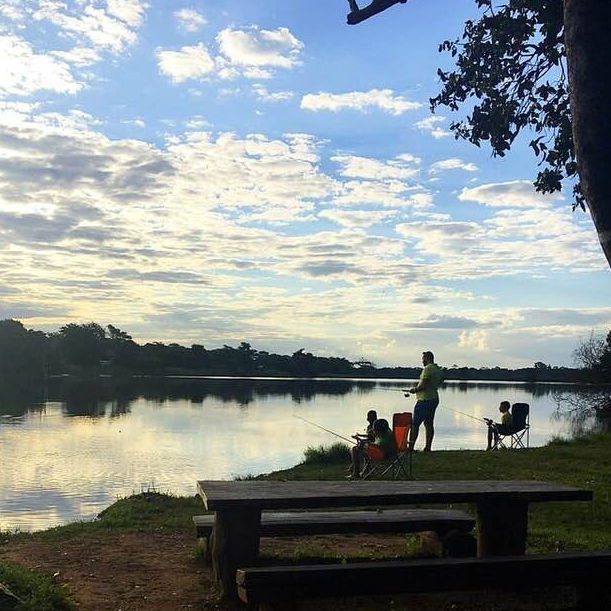 Apart from soaking up the wonderful tranquility of the site and enjoying the cuisine, you may also take advantage of the numerous activities on offer from game drives, bush walks and bird watching to canoeing and fishing in the nearby dam. Mukuyu is offered as either a Full Board or Self-catering camp. Nsobe offers a wide variety of activities catering for all ages. Our current activities available are listed below but feel free to contact us to enquire about others you may wish to do. We have recorded over 320 species on the farm, including Schalow’s and Ross’s Turaco in abundance, Narina Trogon, Pygmy Geese, Temminck’s Courser, African Broadbill and Arnot’s Chat. There are walks cut out in the bush, enabling you to see our varied flora and fauna. The dry season is perfect for game viewing, or lushly green and thick during the rainy season, rich with wild flowers, tree orchids and wild mushrooms. Bikes for Hire to explore the bush at your own pace. At Nsobe Game Camp we also carry out different types of management and team building programmes as well as host weddings and functions. Our name, Nsobe, is the name for the Sitatunga antelope in our local languages, Lamba and Bemba. We are fortunate to have these rare and shy animals. Around the farm there are hides, into which the intrepid can climb at dusk or dawn, sit quietly and, with luck, spot a Sitatunga. Our secluded bushspa has a sauna, a jacuzzi, a sundeck and resident masseuse. Nsobe is part of a commercial farming venture, where animal husbandry and aquaculture are practiced. Tours of the Integrated Fish (Tilapia)/Pig Scheme and Beef Feedlot can be arranged. We have a swimming pool, with a poolside Bar and Grill. there was no school accessible to the village children in our area. Ninety percent of our children’s parents are illiterate and live way below the poverty line. To offer hope and the chance of an educated future for these children, Nsobe Community School was started in 2009. We now have a primary and secondary school, with a full staff of dedicated teachers. Nsobe Community School is a school with a difference. We believe in offering not only education, but education with employment opportunity. We offer a Christ-Centred education, preparing pupils not only for jobs, but for life. Help us to educate these vulnerable rural children, change lives, uplift a community and develop Zambia. Don’t be shy. Stay in Touch! © Nsobe Game Camp | All rights reserved | Website designed by Noo Stuff Design Studio.